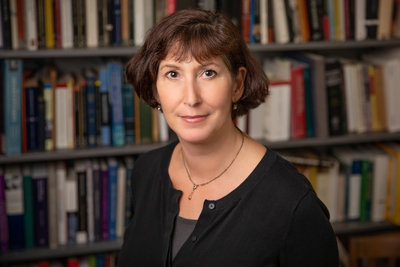 Illinois history professor Carol Symes, an expert on medieval manuscripts, dug into the origins of a book revered in English history and found a different story of its creation, as well as a record of grievances against the Norman conquest. CHAMPAIGN, Ill. — Nearly a thousand years ago, a famous king created a famous book, later given the title “Domesday” (pronounced “doomsday”). At least that’s been the common story: William the Conqueror, 20 years after his 1066 invasion of England from Normandy, ordered a massive survey of his new realm. One year later, he got a book with the results – a record of the nation’s wealth and resources, everything from property to sheep to servants. 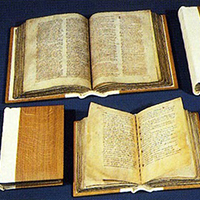 “Great Domesday Book” (above, in two volumes) and “Little Domesday Book” (below, in three volumes). Photo courtesy The National Archives (U.K.). 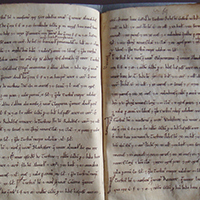 The “Great Domesday Book,” as it was later named, is perhaps the most famous document in English history after the Magna Carta. Now, after years of research, Symes makes the case in the journal Speculum that the final “Great Domesday Book” came years and perhaps decades later than the 1087 date to which it’s attributed, also the year of William’s death. It also was not the orderly bureaucratic enterprise that’s often assumed, but instead “enabled hundreds of thousands of individuals and communities to air grievances and to make their own ideas of law and justice a matter of public record,” Symes wrote. Photo by Carol Symes, reproduced courtesy Exeter Cathedral Library, Exeter, England. “This is documentation of the trauma of conquest. We’re watching people pushing back, or at least letting their voices be heard because they're fed up,” she said. In one example, the text records townspeople bitterly complaining about the leveling of houses to build a castle. 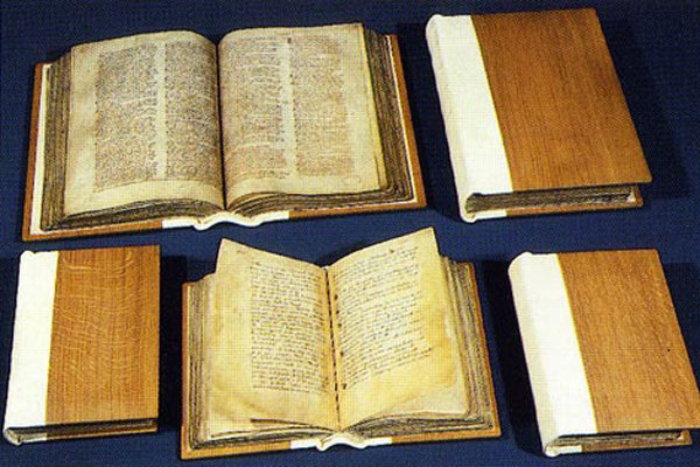 The universe of the “Domesday Book” is complicated, to say the least. The name is attached to two different bodies of text, “Great Domesday” and “Little Domesday” – the first covering all of the country’s shires except three in the southeast, the second covering those three, but in more detail, suggesting it was an earlier draft. There’s also “Exeter Domesday,” a collection of 103 booklets that appears to be an even earlier draft of survey results, mostly covering three shires in the southwest. Curiously, London does not appear in any of these records, which likely is a sign its citizens either ignored the inquest or overwhelmed it with grievances, Symes said. 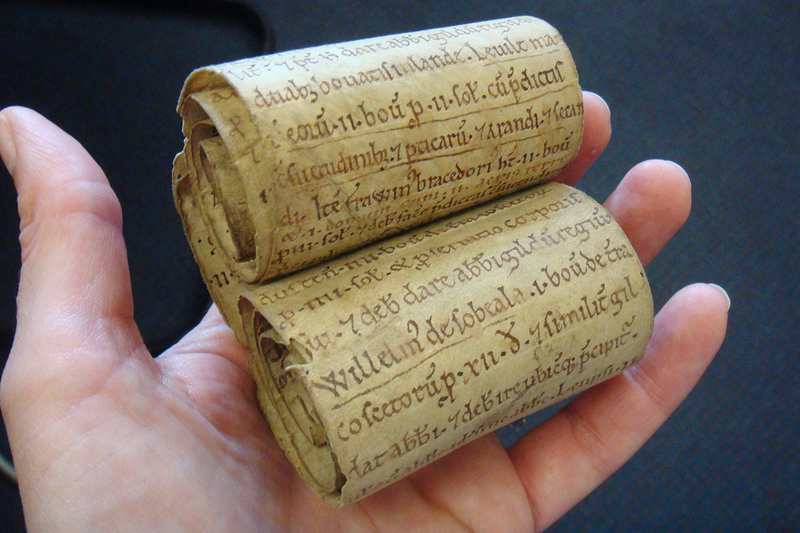 Roll fragment from the abbey at Burton-upon-Trent. Photo by Carol Symes, reproduced courtesy Staffordshire (England) Public Record Office. Among Symes’ contributions is to suggest ways that the different texts relate to each other, since that hasn’t been clear. “I think I have figured out the workings behind how this book (“Great Domesday”) was made,” she said. 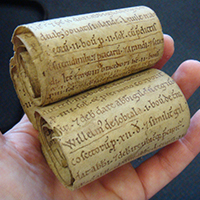 Most of Symes’ research focused on the Exeter collection and another satellite document, a small fragment of parchment roll, perhaps the oldest in England, from an abbey at Burton-on-Trent in the northwest of the country. In both cases, she examined the original documents. 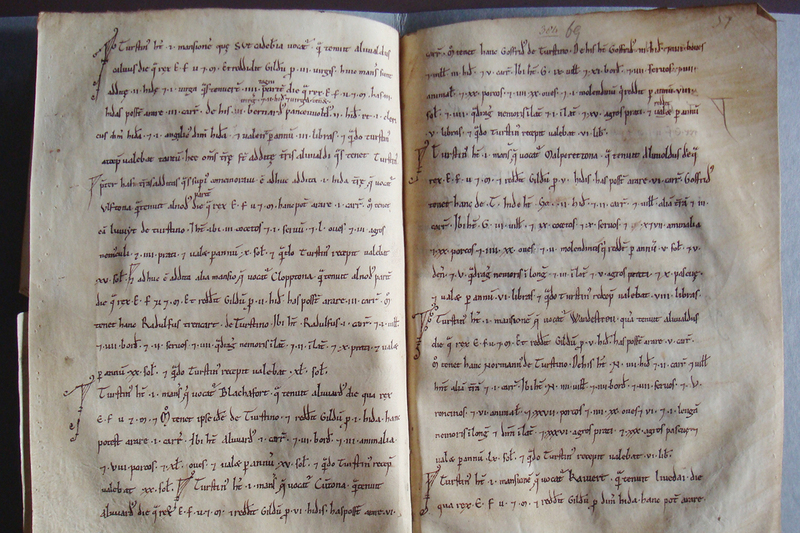 The Exeter documents provide numerous clues on how “Great Domesday” was assembled, but also serve as a window on the people and the process. A bishop can be seen intervening with the king’s advisers when his property is not recorded. Teenage scribes make drinking plans in the marginal notes of manuscripts. 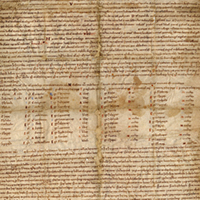 Foundation charter for the abbey at Burton-upon-Trent. Photo courtesy Staffordshire (England) Public Record Office. 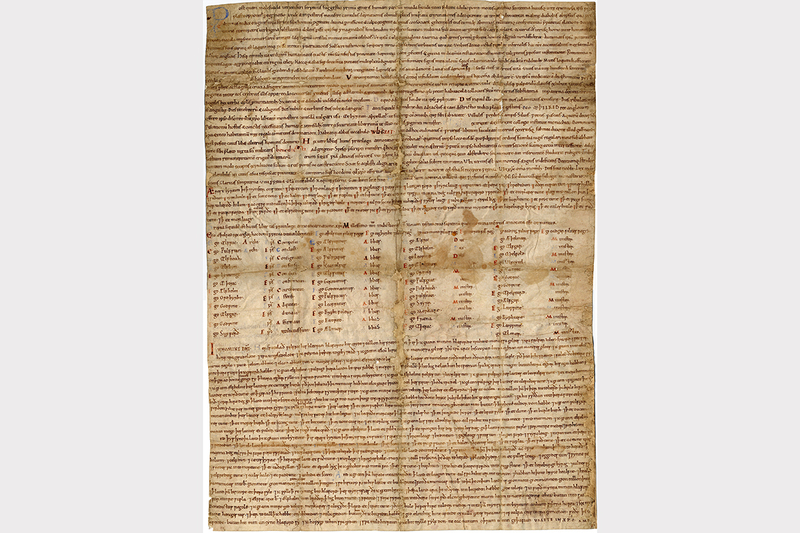 The abbey’s parchment fragment, however, is key to Symes’ contention that the final book came years and even decades later. She ties its contents to the comings and goings of a man who served at one time as its abbot, who had access to the survey data that went into “Domesday” and may even have been involved in the survey. Symes said she was attracted to this particular book as part of her interest in medieval manuscripts, especially the complex ways in which they were “mediated” – i.e., written, handled, copied, recopied, added to, edited, interpreted and heard by audiences, all in an age before the printing press. Historians need to take a text’s complex mediation into account, she said, even considering the parchment on which it was written, to fully understand and not misinterpret it. The “wonderful irony,” Symes said, is that we can do that through one of the most famous books created in the Middle Ages, by a king. To reach Carol Symes, email symes@illinois.edu. The article “Doing things beside Domesday Book” is available here (open access until Jan. 1) or from the News Bureau.